Many of you will know Chris Caffery from his work with Savatage or Trans-Siberian Orchestra but you may not know that he has also been a solo artist since 2004. Pins and Needles is his third solo release and it is also by far his most heavy metal record. On Faces, he touched a number of styles, but here he stays more in a heavy metal mold. That is not to say that there isn’t variety on the disc, but it does stay a little closer to the (metal) bone. The initial release was supposed to be out on Black Lotus Records but they went out of business which worked out well for Locomotive Records because this is a great release and worthy of any Savatage fan’s money. Some of the material sounds like it could have been done by Savatage but a lot of the other music takes on a more modern metal approach. Caffery has grown as a solo artist and it shows because Pins and Needles is his most consistent release. This is a fast paced rocker that is very heavy with a Jon Oliva style vocal delivery. It kind of reminds me of early Savatage because it has that old school feel to it. He also throws in an odd ending to the track that adds something to it. 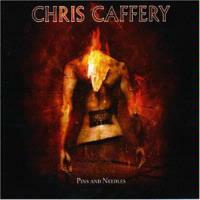 Caffery sings less in a Jon Oliva way here and he has a perfect voice for his music. This is a slower number with a nice groove but the riffing keeps it heavy as hell. Don’t let the doomy intro fool you, this is a modern rocker all the way. Caffery uses varied styles on his vocals, making it seem like there are different singers. It has a number of diverse parts that keep it interesting, not that any of this disc is boring. On this 90’s sounding metal tune, Caffery again utilizes different vocal sounds. There are also varied styles and sounds used here. It’s not a bad cut but it is nothing special either. The riffing is very Savatage sounding but with probably the best vocals on the record. This is a heavy tune that really comes close to a Pantera style riff during the chorus. The song stands for "You Gotta Be F**kin’ Kidding Me." This cut starts off with a more modern metal sound but quickly goes into Chris Caffery solo metal mode. It’s a fast paced rocker that stands out as one of the better songs on the album. I think Caffery is tipping his hat to Iron Maiden on this one as it has that “bounce” that Maiden is famous for. Also added in is a pre-chorus that has Hammerfall all over it. This track is another winner but is not very indicative of the rest of the CD. A quirky guitar sound is used on this piece to keep things fresh. The chorus falls into 80’s metal mode with a little Deep Purple funk thrown in for good measure. I would have liked had they not used the “Satan” vocals but it is still a good track overall. This tune is very euro power metal but like most of the stuff on this CD, there are many parts to each song. There are some slow portions that break up the fast paced sections and that keeps it from getting boring like a lot of the euro metal. Even though keyboards play a big part in this cut, it is certainly not wimpy. It even contains one of my favorite guitar solos off the record. The chorus is catchy making this one of the better accessible tunes on Pins And Needles. Based on the title, it’s no surprise that some of the guitar playing has a middle eastern sound to it. Caffery sings this one in a Jon Oliva style and it could have come off of a Savatage record, except the violin/guitar solo which I think is more Chris Caffery solo. This little guitar instrumental has a Spanish flavor to it. A lot of people forget that metal guitarists are still musicians and masters of their craft. This track shows that Caffery can write a beautiful piece as well as a crunching riff. Even though this is a song by itself, it is more of an intro to the “Temple.” I get a little bit of a medieval vibe off it. It is acoustic guitar and vocals only. “Quaaludio” may not have much to do with Savatage but “The Temple” has it written all over it. It has metal parts but also has moody slower parts giving it that almost epic feel to it. This is another winner on the album. This piano ballad contains some great guitar work. It may seem like it doesn’t belong with the rest of the songs but when listened to as a whole (I played this one through about 6 times), it fits perfectly and belongs exactly where it is; at the end. I’m not one for remakes, but as Caffery said in an interview (also in this issue of MSJ), that this is the kind of track that lends itself to many versions. I like the original, and this one is good also, but I don’t see the point. Maybe that is why it is a bonus cut and not part of the record. I like the “album” version better but this is a nice glimpse into how a song gets formed. It says “alternate arrangement” but it sounds more like a demo. Either way, it is still interesting to have and it gives the listener a choice between versions.